Any “weather weenie” is well aware of the fact that a major storm is coming for the eastern United States (yes, it really is that big). Accuweather.com and the Weather Channel are beginning the hype, Twitter is abuzz with forecasts and speculation (at least in the weather-weenie corner of it), and even the stolid National Weather Service has gotten in on this, with the Storm Prediction Center calling for “Particularly Dangerous Situation” winter storm warnings. (A PDS ordinarily is issued for severe weather—typically, in fact, for the type of severe weather event that has a historic tendency to generate violent tornadoes.) Indeed, blizzard conditions will be widespread across the Midwest, probably affecting an area as large as the “Storm of the Century” of March 1993. The culprits are a low pressure center and a mass of arctic air coming from Canada. The unseasonably warm air that we have enjoyed in the Southeast is going to fuel the system, so to speak. Mid-latitude cyclones such as this one have three distinct sectors: one to the east of the cold front, one to the west, and one that remains to the north. The north sector is what will be producing the snow and ice; north sides of cyclones typically have a constant flow of precipitation, because the cold front associated with the low does not actually pass over these regions. The west side is the “dry” side, in general (though there are exceptions); this is also typically a cold part of the system. That’s what’s going to bring a return to winter temperatures for the South; it will follow the passage of the cold front. And the warm sector is the southeastern side—the side that will have southerly flow from the Gulf of Mexico. These 60s and 70s that we’ve been experiencing, in other words. 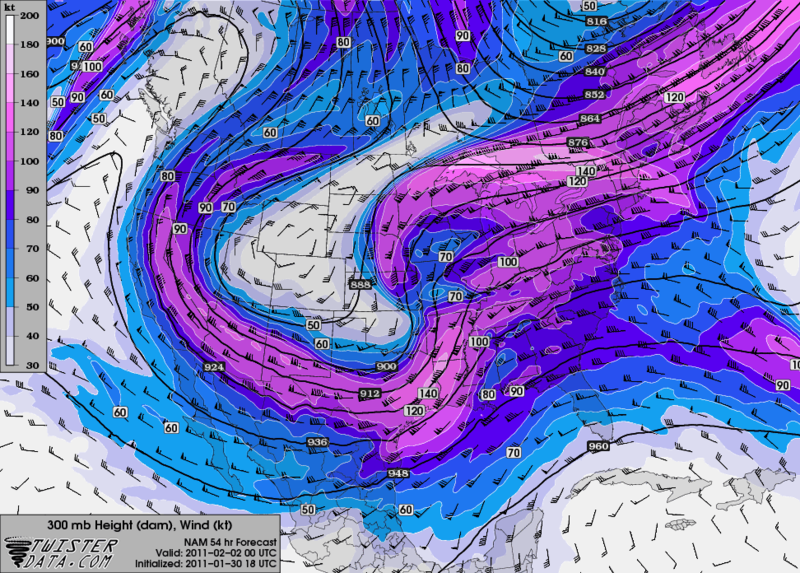 That image shows that the jet at 300 mb (~9000 m) will have 140-knot winds over ArkLaTex on Tuesday evening. The jet typically does have strong winds on the order of 80 knots, which is why it is a death sentence (via shear) for hurricanes in the summer, but these same winds that rip warm-core tropical cyclones to shreds create conditions that enhance cold-core cyclones in the cool season, when the jet is much farther south. 140 is quite strong even for winter. Furthermore, the location of the jet indicates that air will be drawn to the northwest along the eastern end of the strongest points—the exit region, in meteorological parlance. The image doesn’t appear to depict this, but the southeastern flow I am referring to is taking place vertically, and this image only shows winds at the 300 mb level. This will create areas of divergence in Mississippi, Louisiana, and eastern Arkansas. Divergence leads to a “vacuum” of sorts—an area of lower pressure—and therefore to rising air. The second factor is the extreme temperature gradient. Again, take a good look at Arkansas. This is an image from the same time as the one depicting the jet stream, but much lower in the atmosphere (850 mb, or 1500 m). 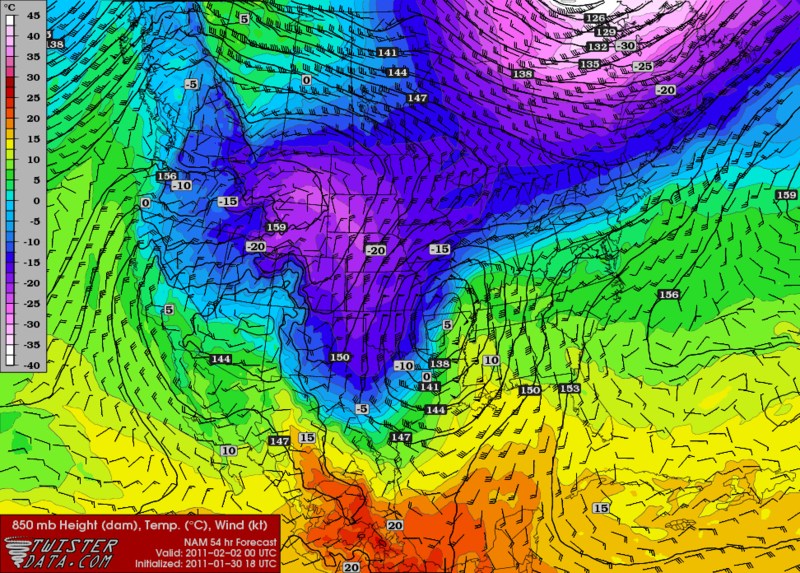 The 850-mb low is located around Fayetteville, and you can see the wind flow around it. But look at the colors, which represent temperature. That is a very strong cold front, and the reason for it is the extremely unseasonable warm weather across the Gulf states. You can see the southerly flow of warm, moist air, creating the warm sector. The wind flow will be moving warmer air into areas of cooler air (the wind barbs are crossing isotherms), a process called warm-air advection. Look at the strength of the winds at this level, too. 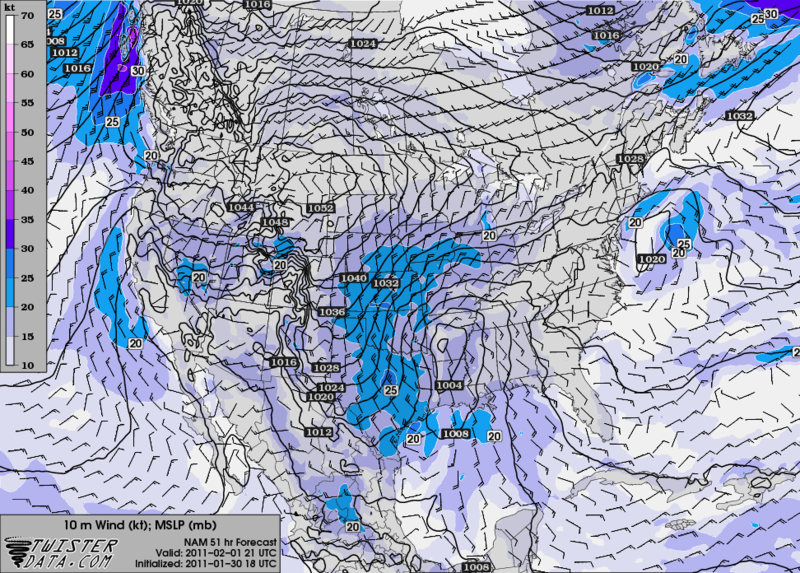 There are 65-knot winds forecast at 850 mb! This is hurricane-force. I will direct your attention to the isobars over the Plains. The low hasn’t even fully intensified yet, but already there is a 40 mb gradient because the high is so darn strong. It is this pressure gradient that will be generating the intense winds with this system, producing blizzard conditions north of the freezing line, and severe weather south of it. Now, the $64,000 question: What type of severe weather are we talking about? None of the above sounds like particularly good news, but fortunately (for north MS, at any rate), I do have some comparatively good news now. I do not think our tornado risk is going to be all that high, nor our large hail risk. Instead—you guessed it—I think we are in line for some very strong winds as the cold front approaches us late Tuesday night/early Wednesday morning, combined with a lot of rain and the chance of small hail. There will be some instability, but CAPE levels are not going to be much higher than about 750 J/kg across Mississippi. The helicity index, a parameter reasonably predictive of supercell formation, is not expected to be very high. I think there is a chance of supercells in south MS (let’s say south of I-20), but at the present time I am not seeing this type of severe weather event on a large scale. However, as people in north MS can certainly attest after the repeat punches of severe weather over the past year, high winds can be damaging enough on their own, and this system has the potential to generate some very strong winds for us. All in all, though, I think we are dodging not one, but several bullets with it.